Helping someone you care about in a bereavement is an emotional and worrying time. We can help - we are a team of caring, experienced, professional florists in Auckland. We understand the cultural sensitivities, and can advise on the most appropriate and easiest flowers for the family to take care of, during their time of loss. 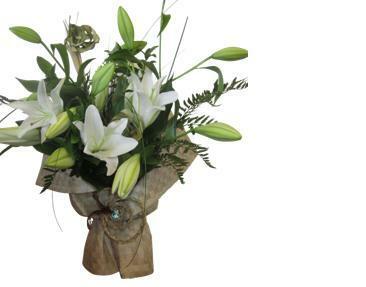 A water-filled vox bouquet is the most popular option in New Zealand to send to the home of the bereaved. It is long-lasting and entirely convenient for them to receive. It is entirely appropriate to send either white flowers, soft pastels as a sign of your grief, or if you prefer, choose bright colour flower bouquets to celebrate the life of the deceased. We would also suggest a floral arrangement as an option. These are arranged in Oasis (water filled florist sponge) and to take care of they just need to have water added daily. We have soft and subtle box arrangements of flowers, pretty garden arrangements, and sympathy baskets. basket can be sent to the family to send your loving thoughts. You are welcome to call us, to discuss how we can help with the floral arrangements on 09 838 9058, or please order securely online.